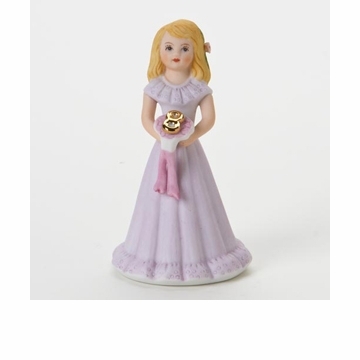 The eight year old birthday girl from Enesco is crafted of porcelain with a matte finish. The little girl is wearing a lavender dress. From the Growing Up Girls collction by Enesco. This eight year old girl figurine has blond hair, but she is also available with brown hair. Give the special eight year old in your life one figurine each year until she completes her collection.